​Justrite® PE Drum Funnel (100% recycled material). 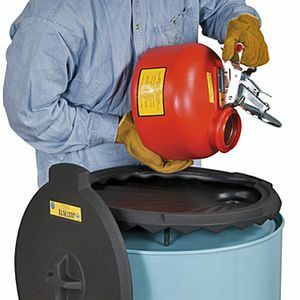 For all closed 110 and 200 litre drums, the low profile of the drum funnel and the large diameter of 533 mm permit a rapid and easy pouring into drums. ​Drum funnels are made of chemically resistant, high density polyethylene and are well suited for highly flammable corrosives and acids (see Chemical Resistance List). Corrugated surface for quick liquid flow, even if you place, for example, an oil filter directly on it. a funnel lid with gasket to prevent escape of hazardous or flammable vapours.